Many folks, even the Chinese, who heard of Feng Shui （风水）, thought that Feng Shui （风水） is just "Feng Shui （风水）" and there is only one type of Feng Shui （风水）.. which is wrong. There are many different schools of Feng Shui （风水）. Whether You are searching high and low for a Feng Shui Master for Feng Shui Audit for Your Home, Business Office or Factory, or You are searching for Feng Shui Knowledge or looking for a Feng Shui Class to learn Feng Shui (风水), it is a must for You to understand the origin, history and different schools of Feng Shui （风水) so that You can make a better decision. Feng Shui （风水）, was originally known as Xiang Di (相地) , meaning "The observation and analysis of the ground". The practice of Xiang Di (相地) helped the Chinese to select the right place for settlement and location of shrines, temples and fertile lands. It is from this time that some of the basic principles of Feng Shui （风水） was developed. The pre-classical period of Chinese history, there is evidence from oracle bones and other artifacts that solar and lunar eclipses had been recorded. Constellations were recorded in the Book of Odes (诗经) (9th century BC) and a system of divination called Zhan Bu (占卜) was used to determine the auspiciousness of a site. 'Zhan Bu' deals with the nature of water on a site and underground streams. It is at this period that the study of the I Ching (易经), He Tu (河图) and Luo Shu (洛书) was popular. Chinese theories on the nature of the Universe such as those elaborate by the Taoists also play a part in shaping the Feng Shui theories. Hence, Yin / Yang (阴阳), trigrams of the Ba Gua (八卦) and the five elements (五行) came to have a place in Feng Shui practice. The 1st Ancient Chinese Book that wrote about Feng Shui was Qing Nang Jing(青囊经) - The Green Sachet, Author: Huang Shi Gong (黄石公), dated around 220BC. The concept of Di Mai (地脉) (the arteries and veins of the earth), were studied by the ancient geographers. Di Mai (地脉) refers to the ridges and valleys of mountain ranges. The combined study of geography and astrology, the study of heaven, earth and study of the environment (mountains and water) by taking into account their shape and their direction. This is well known as Kan Yu (堪舆). More detailed study of the mountain ranges of China was also carried out and this marked the beginning of the term 'Dragon Veins'(龙脉). For the term Kan Yu (堪舆), "Kan 堪" means "way of heaven (天道)", while "Yu 舆" means "way of earth (地道）". Thus Kanyu means the "study of the heaven and earth". Its foundation is based on He Tu - Luo Su Drawing (河图洛书). By combining this with 8 trigrams, 5 elements, the way the heaven/earth operates and human factors, it became a theoretic means to carry out divinition of humans and buildings. Translated as "Kan is way of heaven, Yu is way of earth". Ever since KanYu or FengShui was developed by the Ancient Sages it has evolved into many different schools of thoughts (called ‘Pai’ 派 in Chinese). It was a time when the study of Feng Shui assumed several forms. Guo Pu (郭璞) (276-324AD) wrote The Book of Burial (葬书), documented proper burial methods and sites in a book, titled Zhang Shu (葬书). It is in this book that the concept and methodology of Feng (Wind) and Shui (Water) were clearly explained and presented. These were three periods when Feng Shui became more scientific and gradually its activities became increasingly differentiated, giving rise to different schools of thought. Using the principles of Feng Shui at a gravesite became common practice and even spread to the peripheries of the empire. During the five dynasties period (907 - 960 A.D.) feng shui practice became differentiated into 'Yinzhai' 阴宅 (residence of the dead) and 'Yangzhai' 阳宅 (residence of the living). It was only during the Tang Dynasty that Feng Shui was formally taught by Yang Yun Song (楊筠松)(834－900). Fondly known as the "Yang the Saviour of the Poor" (杨救贫), Yang had an excellent grasp of Feng Shui knowledge and imparted it to the common folks. Yang Yun Song (楊筠松) , a librarian from Tang dynasty who has formalized Xingshi Pai (形式派 ). During this period, the basic concept of Feng Shui was created, which was called the Huang Di Zhai Jing (黄帝宅经). Feng Shui influenced the making of decisions such as building sites, burial sites, and irrigation which in turn has a bearing on the fortune of a family. The importance of feng shui thus began to focus on the external surrounding of a dwelling such as the direction and landform than on the internal environment. This is the time where many taboos regarding the construction of buildings emerged including the popular practice of choosing an auspicious date to lay the foundations of a new building. This is when a certain amount of superstition began to associate with Feng Shui. 1) The difference between Feng Shui compass doctrine and form doctrine becomes so real. 2) The use of Feng Shui compass (Luo Pan) more common at this time. 3) The compass doctrine became more popular than form doctrine. In this period its recorded more than 120 kinds of Feng Shui compass doctrine. Yuan Dynasty was ruled by the Mongols, who are not native Chinese. Chinese culture, including Feng Shui was suppressed. Feng Shui went into a decline. Feng Shui remained popular. Practitioners during the Ming Dynasty were then called Yin-Yang experts. Numerous scholars worked on subjects related to Feng Shui. Construction plans closely adhered to Feng Shui principles. Many techniques of Feng Shui were further developed, including popular methods we have today, among them the "Fei Xing' or "Flying Star Method' 飞星, 'Ba Zhai' or 8 house method 八宅, 'San He' or the 'Triple Combination School' (三合), 'Ming Gua' (名挂) or destiny number school and that based on the Chinese horoscope known as the '4 Pillars Of Destiny' (四柱) and the 'Zhi Wei' or Purple Palace Astrology 紫薇. The practice of Feng Shui was made illegal after the founding of the People's Republic of China in 1949 as the new government determined to eliminate the "four olds", namely the old ideas, old culture, old customs and old habits. Feng Shui continue to be practiced in Hong Kong, Taiwan, and Southeast Asian countries. While PRC government is still skeptical of this science, Chinese people has spread Feng Shui widely throughout the world. Most of the Oversea Chinese aim to continue the culture and traditions, while others intend to commercialize. In Taiwan and Hong Kong, the ancient knowledge of Feng Shui for Agricultural Landscape has adapted to modern world and produce new Feng Shui Books for modern architecture and modern days living. After the 80s, there is a great revival of Feng Shui interest in China. Feng Shui is a part of China's traditional culture, which has never really died out and is gaining popularity in China's affluent coastal cities including Guangzhou, Shanghai and Shenzhen. Even though it is still "illegal" in China, Government Officials and Chinese Tycoons are discreetly seeking Feng Shui Consultation for supernatural shortcuts to wealth and power. 1. Li Qi Pai (理氣派) (Qi Management), commonly called Compass School. 2. Xing Shi Pai (形勢派) (Terrain or Topographic School), commonly called Form School. One highly misconception on the two schools of Feng Shui is one school uses Lup-Pan （罗盘） (Chinese Feng Shui Compass) and the other one doesn't. In fact, all methods and techniques of Feng Shui study Forms and use a Luo Pan （罗盘）. San Yuan Method (三元派) - The uniqueness of San Yuan (三元) is that they place great emphasis on Timing. 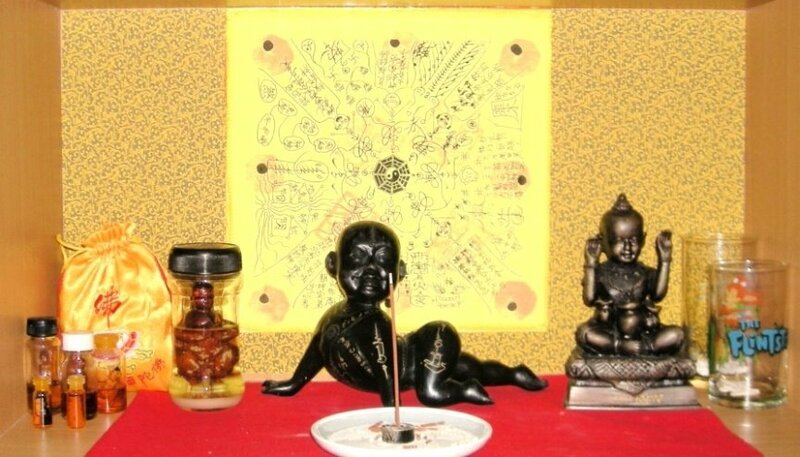 San He Method, (三合派) (Environmental Analysis Using A Compass) - San He Method, (三合派) have many subjects such as 8 Mansion, San He Water Methods, Yang Gong Feng Shui which uses Landforms heavily and downplay the role of time factor. Most major Feng Shui systems, methods and techniques will fall under the main branches and sub-branches of Feng Shui Schools listed above. Even with this subdivision, it is important to take note that both schools pay attention to Qi flow and Landform - the difference is the emphasis of the techniques, methods and formulas. Generally, San Yuan School (三元派) focus more on Qi calculation over landforms assessment, whereas San He (三合派) focus more on landforms assessment over Qi assessment. With the above information, You now understand different Feng Shui Masters apply different Feng Shui School Of Thoughts to audit Your Home, Your Business Office or Your Factory. With Zero Knowledge on Feng Shui, You won't know the differences in the different types of Feng Shui Audit available in the market. However, now at least You know there are different Schools of Feng Shui and You may ask the Feng Shui Master about which School of Feng Shui Method he is applying for the audit / consultation. At the minimum level, You know what is going on. Previously, You might have thought that Feng Shui is just Feng Shui and You just need to study "Feng Shui" and after studying "Feng Shui", You can start practicing Feng Shui and charge people money for Feng Shui Audit. Now, You know there are so many different Schools of Feng Shui and You are spoiled for choice and don't know which type of Feng Shui to learn. You may pick one of the Feng Shui School of Thought and start learning and get good at it. Later on, move on to other type of Feng Shui Studies. By mastering one Feng Shui School of Thought, it will be easier for You to learn and master other types Of Feng Shui later. If You want to be a true Feng Shui Expert, like the ancient Chinese Feng Shui Masters, it is a must to be proficient in Chinese Language, so that You will be able to read the Ancient Chinese Feng Shui Books / Texts to absorb the full essence of Feng Shui. It will be good if You can adjust Your heart,mind and soul to Taoist Philosophy as well, so that You can see and sense the surrounding Feng Shui with the special intuitive power of a Taoist Master. Feng Shui Audit / Consultation and Feng Shui Knowledge in the Western Countries and to the English Educated Chinese..
Feng Shui is an Ancient Chinese Wisdom and Culture. There are altogether few hundred genuine Feng Shui Books / Texts, written in Classical Chinese, by the Ancient Feng Shui Masters, which are not translated into English. There are even more "Feng Shui" Books and "Feng Shui" Magazines written in English by English Educated Feng Shui "Masters". The reason why Chinese took Feng Shui to the West is about the MONEY - TO MAKE BIG MONEY. The Chinese Feng Shui "Masters", took a bit of Feng Shui Knowledge and then sell to the Western World. After that, the Western Folks, who can't read Chinese, learn a bit about Feng Shui and then BLOW IT UP (Westerners are very good in Blowing Their Own Trumpet) about how good they are in Feng Shui and then both the Chinese Feng Shui "Masters" and the newly trained Western Feng Shui Students -Turn - "Masters" compete one another to lure other Western Folks and English Educated Chinese into Feng Shui Audit / Consultation or get into their Feng Shui Classes / Seminars and this cycle of Folks learning limited Feng Shui and then turn into self-proclaimed "Masters" almost immediately, repeats itself. The problem is modern Feng Shui "Master" Wannabes are more interested in making A Lot Of Money through Feng Shui Audit / Consultation , in which they spend more time in Packaging their Image, Products and Marketing , instead of spend many years to read / learn and absorb the mind of the Ancient Chinese Feng Shui Masters. In certain Feng Shui Schools, there are Taoist Magic / Sorcery / Talismans involved, which are not taught to the Western Countries. The reasons are most Feng Shui Masters don't know Taoist Sorcery, and also Chinese Feng Shui Masters know that in order to bring Feng Shui to Western Market, they must make Feng Shui look "Scientific" and nothing to do with Religion (Taoism) or Sorcery / Magic. Whether You like it or not, the truth is anything that is related to Ancient Chinese Knowledge and Culture, it will always base in Taoism Philosophy / Thoughts / Science and Religion.